This is a really nice embossed cardboard sign from the Capital City Dairy Company in Columbus, Ohio. 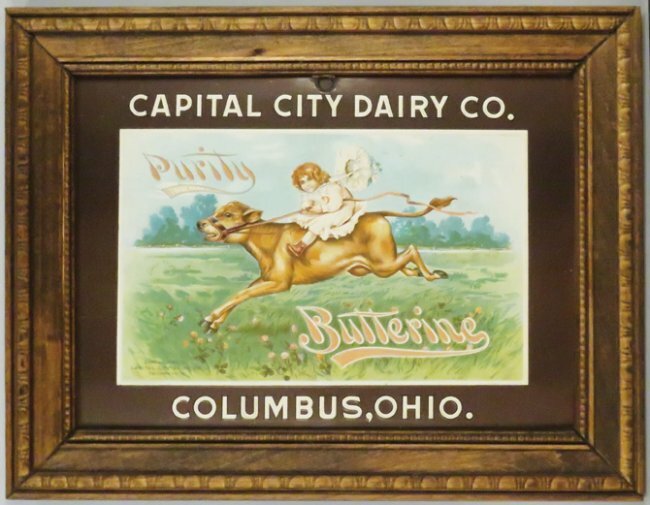 The image shows a young girl riding a cow with the words Purity and Butterine also. This sign is a beautiful hanging tin sign advertising the Sharples Tubular Cream Separators. Circa 1915. 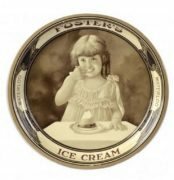 Featured is an early metal serving tray from the Foster's Brand of Ice Cream. Foster's was apparently based in Waterloo, but I don't know if that was IA or NY most likely. Featured is a gorgeous advertising wooden diecut trade sign from an early ice cream or confectionary store. This could have also come from a soda fountain possibly. Featured is a nice scalloped reverse on glass sign from the New Haven Dairy Company for their Ice Cream and 5 cent ice cream cones. New Haven, CT or New Haven, MO most likely being the origin of this sign. 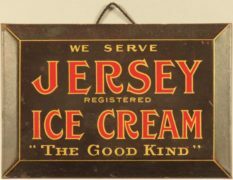 Featured is a beautiful TOC sign advertising a local Jersey Ice Cream Brand, calling itself "The Good Kind". Circa 1930. This beautiful self-framed tin advertising sign from The Sharples Separator Company in West Chester, PA. features a woman who looks like a fairy with wings getting cream for a young girl, while the cow looks on with much interest. 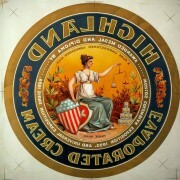 Featured here is an advertising decal designed to be applied to a metal tray or sign from the Highland Evaporated Cream Company in Highland, Illinois. This company later became the Helvetia Company and eventually moved to St. Louis, MO where it was renamed The Pet Milk Company. Circa 1895. 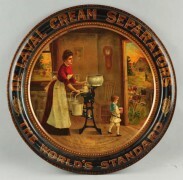 A wonderful porcelain advertising sign from the Pevely Dairy based in St. Louis, MO. Circa 1915. This advertises "Baby First" on the sign. 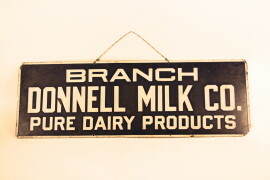 This is a nice porcelain sign from the Donnell Milk Company, for their Pure Dairy Products. The company was based in St. Louis, MO. Circa 1930.